Venus flytrap repotting |Sundews Etc. 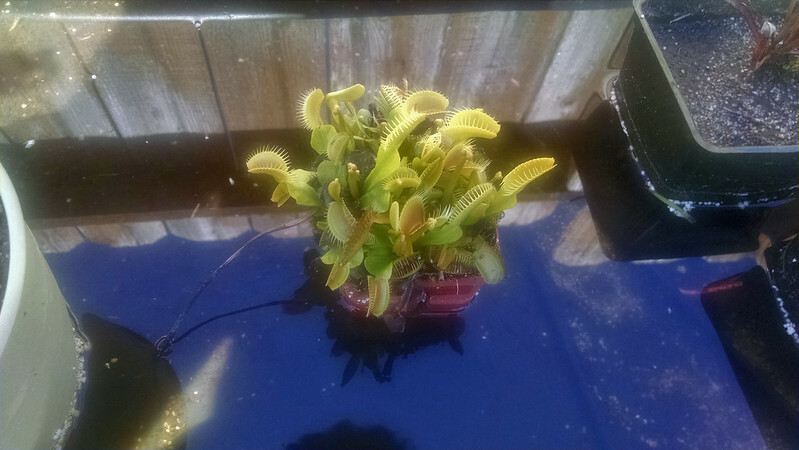 I got my first Venus flytrap (Dionaea muscipula) from the Cactus Jungle back in October of 2013. 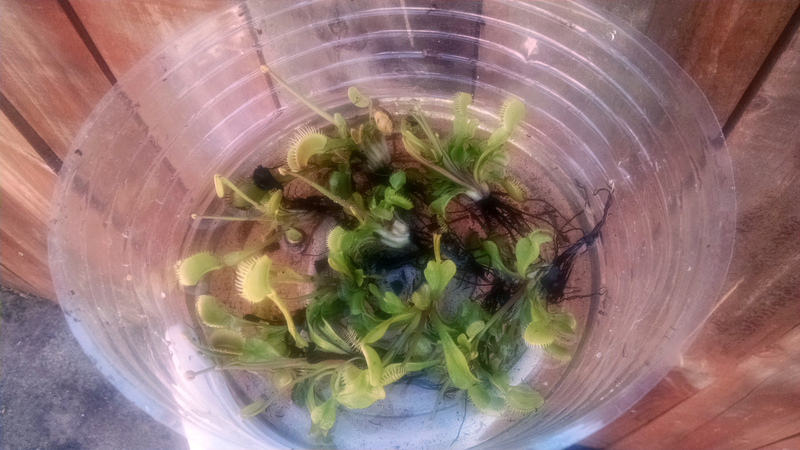 Strictly speaking, it was my roommate's plant, but he very quickly gave me full custodial rights. Here we are right out the beginning. Now, I like D. muscipula as much as the next guy, but they don't excite me as much as they excite, say, the Carnivore Girl. So I've sort of ignored this guy for the last 18 months or so, but recently things have started to get ridiculous. A brief note before we continue – it was much, much too sunny out today to take decent pictures, at least with my phone (which is, at best, a blunt instrument). 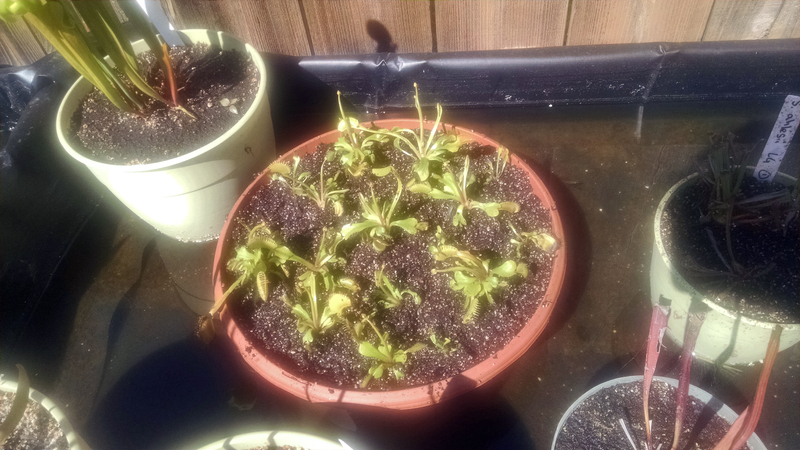 I was also busy repotting and trying to not get my phone wet and covered in peat. It took some serious Photoshop to get these in even semi-workable condition. Anyway. 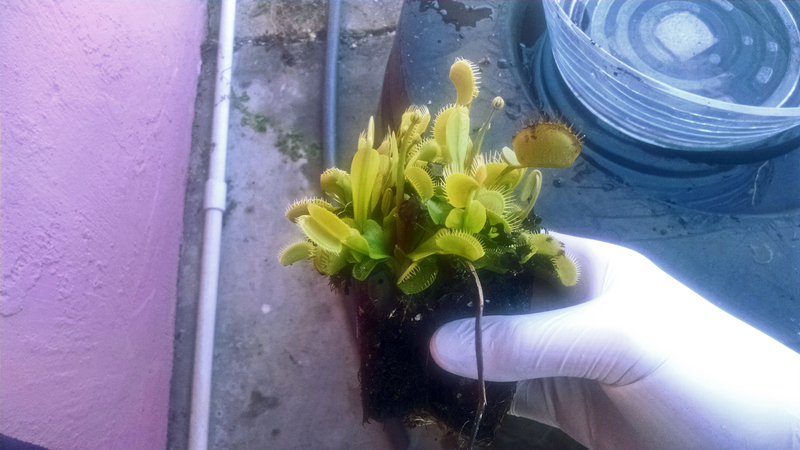 On to the plants. A bit crowded in here. As you can see, things uh, went a little crazy. The Cactus Jungle gets its VFTs from tissue culture, just like almost everyone, because VFTs are really, really cheap from tissue culture. 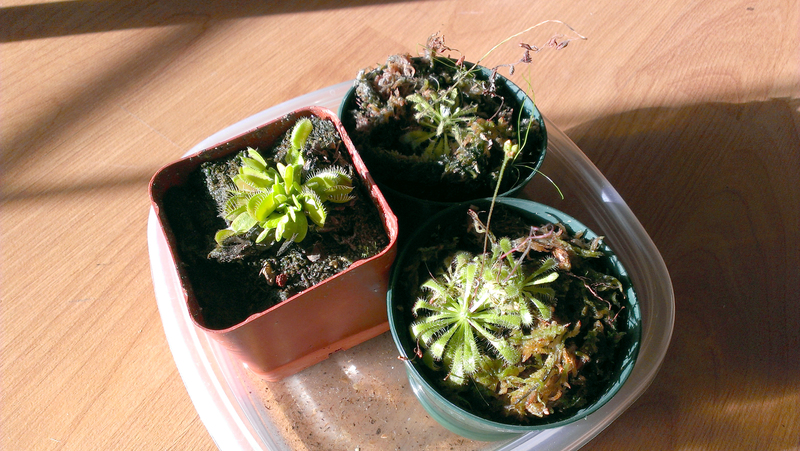 One thing that happens with TC plants is that they can clump like crazy in the first year or two. That appears to be the case with my little plant. Luckily, I had a plan. I was excited to find this pot. A big pot. 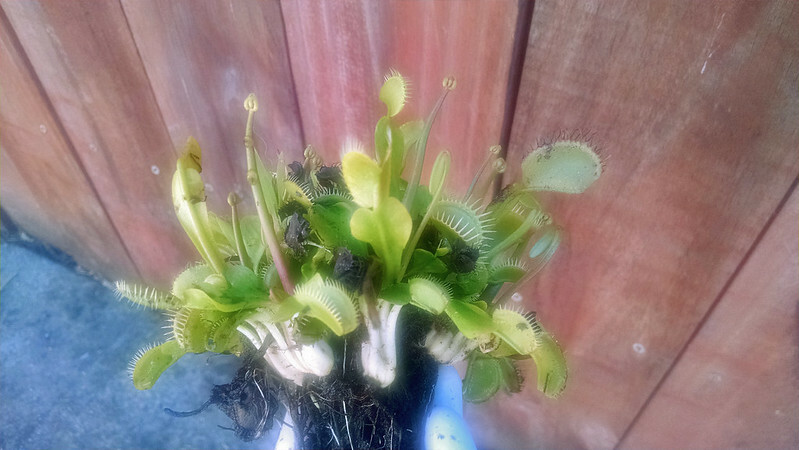 When I first started growing carnivores I came across a photo (which I can't find at the moment) of a nice, wide pot filled entirely with beautiful Venus flytrap mouths, all red and hungry-looking. It was pretty cool, and has been a minor goal in the back of my mind ever since. 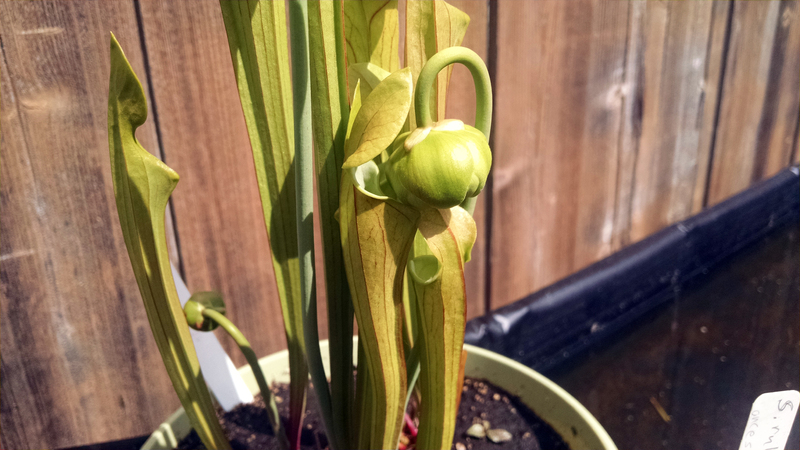 I picked this pot up at California Carnivores a couple weeks ago specifically for this purpose. First though, I had to get this thing divided. Pretty good for a 2-inch pot. Based on the flower stalks I guessed there were at least 10 big divisions in here. 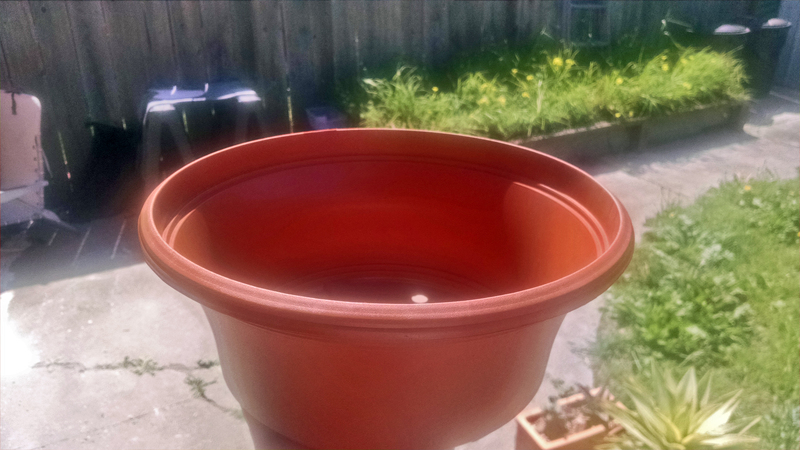 I got it out of the pot and then started spraying it gently with the "center" setting on my garden hose. This started to reveal some nice-looking rhizomes. They were all pretty healthy. I then sat there working them apart and hosing them off before depositing them in a bit of a bath to wait it out (I learned this bit from the Carnivore Girl – her pictures are better though). All told there ended up being 11 big divisions and 4 or 5 very small offsets that may or may not survive the stress of repotting. In any case, things are looking much better now. Now with some room to stretch out. Can't wait to see what this will look like with a full growing season under its belt. Now, in order that I not fill a post entirely with over-manipulated, ugly photos, I present for your consideration this Sarracenia oreophila, which is inviting its pollinators to play a very dangerous game. You can never trust an oreo.